"What do you want from me?" he asks. What I want from every person in my life, I want to tell him. More. Melina Marchetta is one of my favourite authors ever. With each book she just amazes me more and more. If I'm honest, Jellicoe Road really intimidated me. I put off reading it for such a long time because I'd read that the story is a little confusing and a bit hard to get into. People also rave about it and I didn't want to let my really expectations get in the way of my enjoyment of reading one of my favourite authors. Instead, I waited. And I waited. And finally, while on holiday, with plenty of time to relax and to sink into a fabulous book, I started it. And I loved the story immediately. 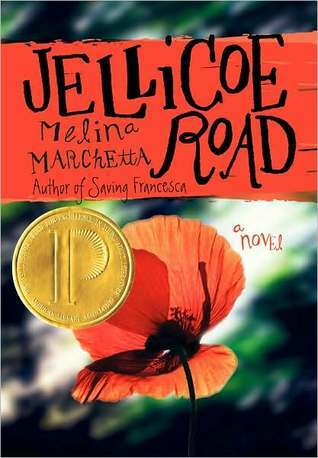 And Jellicoe Road seems very different to the other books I've read by Melina Marchetta. It feels like the story goes deeper and darker than her other books. The story is told in two different parts at the same time. One part focusing on a group of students at this school on the Jellicoe Road in the present day - three different warring factions with all of these rules of interaction as they're fighting for control of different surrounding areas. And the second part tells a story of a similar group of students twenty years previously. How and why the two stories are connected is at the heart of the novel and it was an incredible journey solving that mystery. We begin Jellicoe Road with this really dramatic opening of a car crash that throws the reader and our characters into this awful situation where lives have been lost. I think that death and grief is a huge aspect of the novel and it really permeates both of the parallel stories. There's a lot of grim subject matter that was quite difficult to read, death, suicide, child abuse, neglect. Taylor Markham, main character in the current day storyline, is a student at the school. She's led a very difficult life, one that, as we learn more details, becomes more and more heartwrenching. She's tough though, and while she would like to remain distant and seperate from all in her life, it just isn't possible. When caretaker and surrogate-mother, Hannah, mysteriously leaves with barely any notice, Taylor feels incredibly lost. She's determined to learn more about Hannah and Hannah's history in order to find out where and why she's left. Being elected leader of one of the three warring groups, Taylor must also come into contact with Jonah Griggs, one of the cadets that she's had this emotional history with. Together with a surprising cast of new friends, they discover their own personal histories as well as the school's history and the intersection between both sets of stories of students current and past. Jellicoe Road is a beautiful story which is constructed and written amazingly well. It's so emotional and sad and hopeful. There's moments of absolute beauty and tenderness and romance. There's so many different themes to the story, that of friendship and family, grief and loss, secrets and truth. It brings tears to my eyes even now just thinking about this book. Jellicoe Road is a masterpiece of storytelling and it will stay with me for a very long time. This book sounds really good. *adds another book to wish list* Great review! I keep seeing this book! This author is not familiar to me, but I do like the sound of this book. I really have to get my hands on a copy of this. Ooh what an interesting sounding book, I think I could get along well with this. I've been wanting to read Jellicoe Road for a long, long time - I've actually never read anything by Melina Marchetta! Glad you enjoyed it, it sounds amazing :). Isn't it amazing?? I'm so glad you've finally read it. I read it last year but actually just finished listening to the audio recording today and found myself sobbing at the end (it's beautifully read). I've read all of Marchetta's books now and while they are all excellent none reach the heights of Jellicoe Road, except for perhaps her most recent, The Piper's Son which is also brilliant. Zoe - Oh it IS really good. Really wonderful to read. Vivienne - Melina Marchetta is INCREDIBLE. One of my favourite EVER authors. Cliona - Perfect way to describe this book! Sophie - I second that. Jenni - This is a really, really GREAT book. Liz - Oh you must! I love Melina Marchetta. Sya - YES! It is amazing. I still have Finnikin on the Rock to read, but The Piper's Son also blew me away. I read this book when it first came out and really enjoyed it. Glad you did, too! This is a book I really want to read to see if it's as good as people say! Jodie - YES, PLEASE DO! Also, I'm sure that it will be.